After my earlier success with repairing a lockset, I thought I’d fix a number of other locksets that were causing us issues. 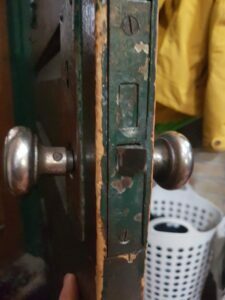 The first one, our back door, was starting to only open when the doorknob was turned in one direction. In the other, it didn’t work. 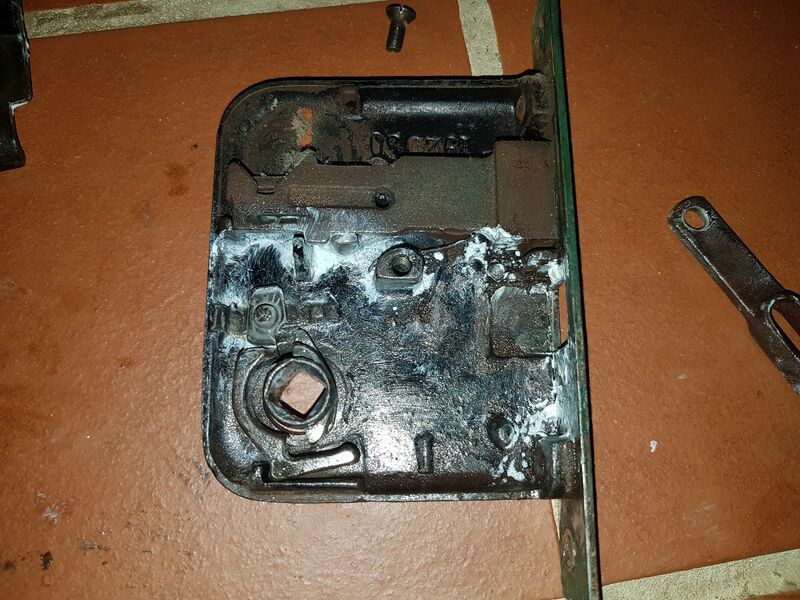 It turned out that the single screw holding the cover of the lockset case on was loose. 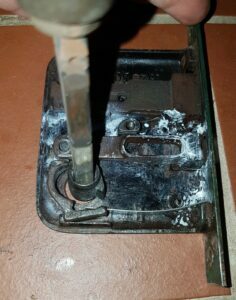 This allowed the mechanism inside to slip when the knob was turned one direction but not the other. Tightening this screw fixed things right up. The second issue was with our basement door which has not worked at all since we moved in. I was hoping that a simple repair was in order. As you can see, that was not actually the case. When I removed the lockset, I found it was actually in pieces. 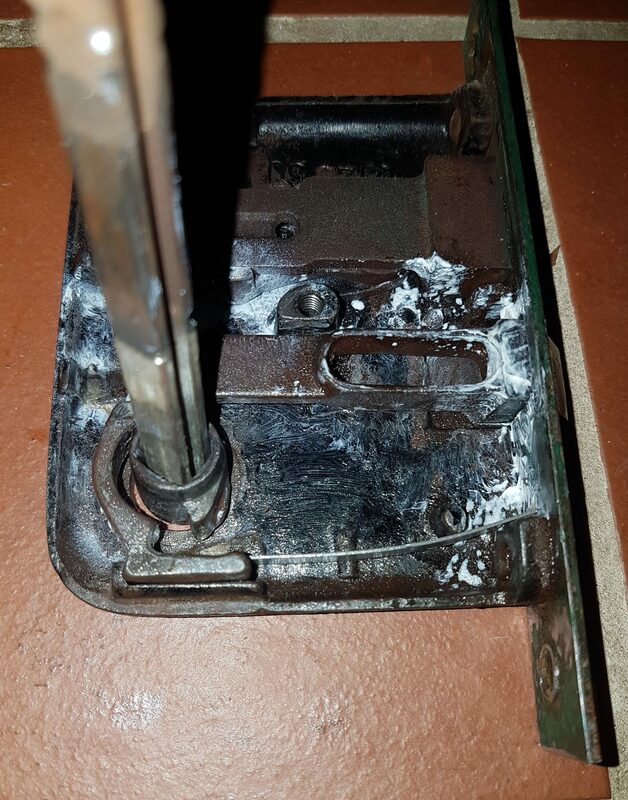 The damage had clearly happened long in the past as there was already a makeshift metal strap in place holding things together. There was no repairing it so it needed to be replaced. The best case scenario would be to simply substitute in a replacement lockset and have done with it. 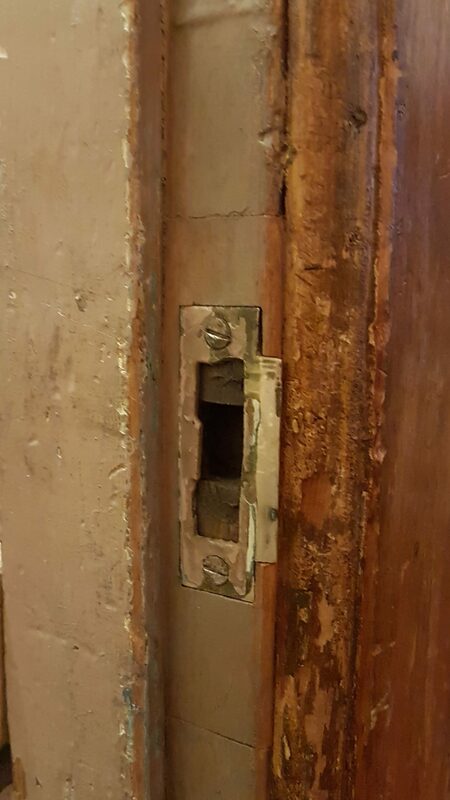 Unfortunately, for some reason, the lockset in this basement door is different than all the other ones in the house. As a result, I couldn’t use any of the other ones that I had on hand (bottom two in the image below). 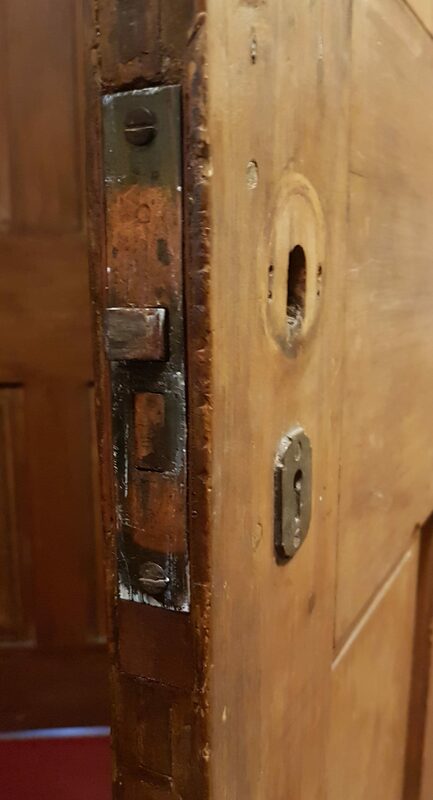 All were too large for the mortise or the location of the spindle would have required making an new hole in the door. This type of modification would have been very difficult to hide. Luckily, my father had collected the locksets from my grandparents now abandoned farm house so I had some additional pieces to work with (top right in the above image). 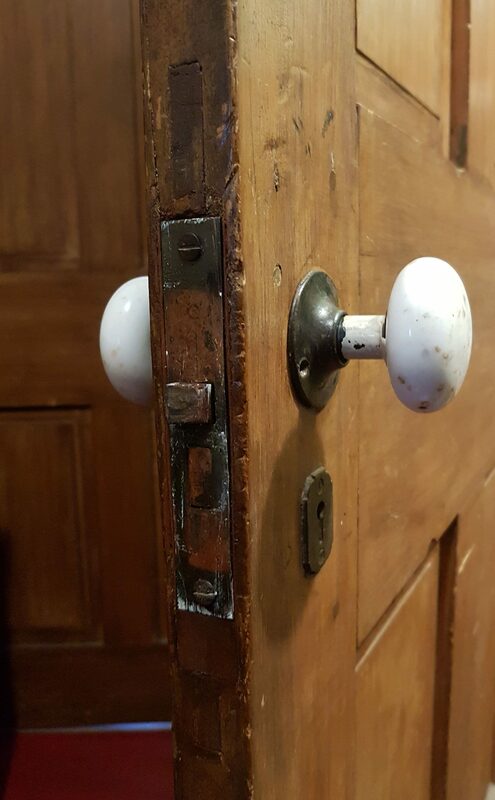 It turns out that they were small enough to fit the mortise in the door and had the spindle in the right location. 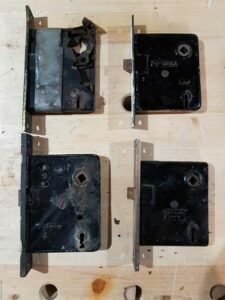 On the down side, the face plate of the lockset is much smaller and thinner than the original. 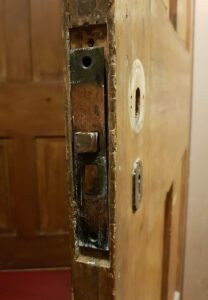 As a result, I was forced to make some changes to the door mortise to accommodate this. 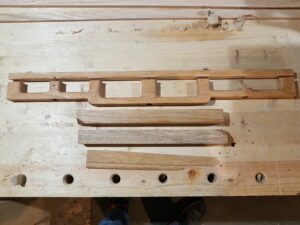 I started with the empty mortise. First step is to inset a piece of wood to fill the cover of the mortise. I used some salvaged antique pine that I had in my breaker pile. 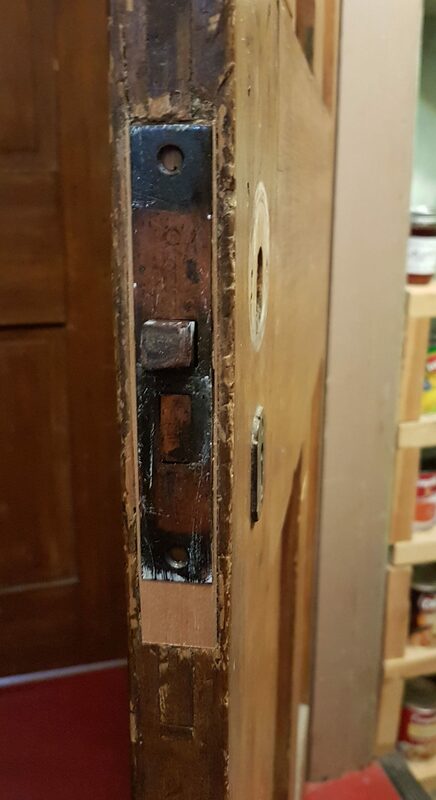 Once the glue had dried, I trimmed the patch flush with the original door. 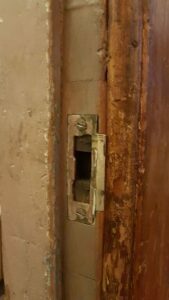 I followed this by cutting out an opening to fit the new, smaller lockset. You may be able to see some additional new wood along the bottom of the mortise. Since the new lockset was smaller, I glued in a strip of wood to take up the vertical play in the mortise. 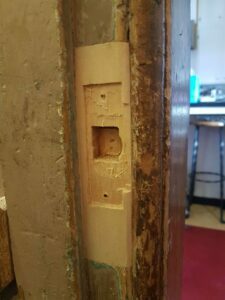 Next was to mark out the location of the new lockset face plate for the inset. And use a chisel to create the recess for the new plate. 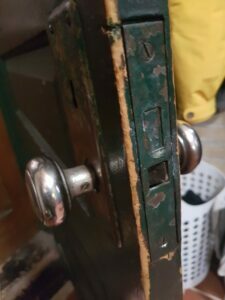 I know that some of the break out looks bad here but it now fits the new lockset very nicely. All that is left is to use shellac with various dyes and earth pigments to make the patch look like it was part of the original door. With the lockset back in place, you can hardly tell that it is a replacement other than that it works. 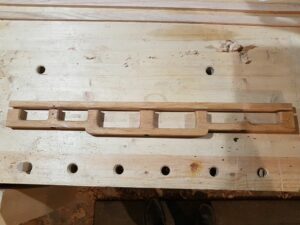 I figured since I was doing the door mortise, I should likely do the strike plate are as well. 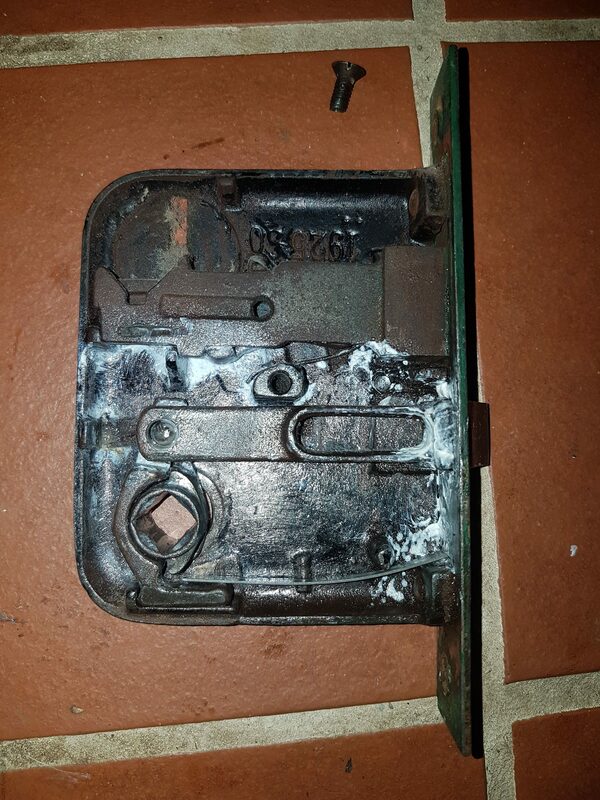 As you can see, the strike plate had been moved around quite a bit over its life. 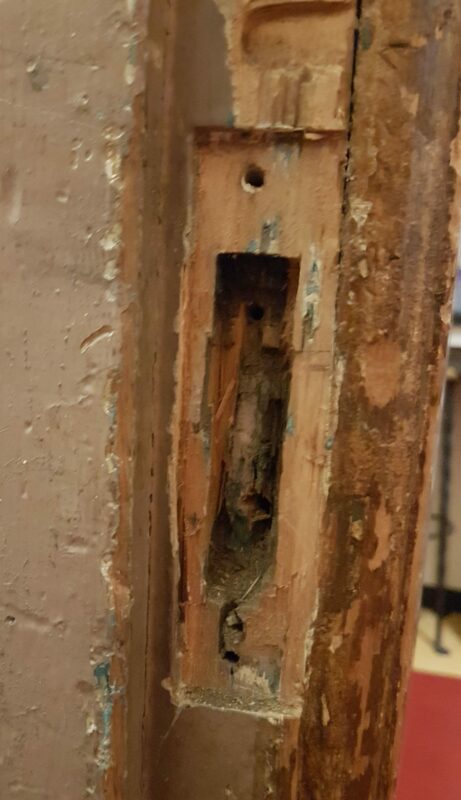 As a result, the wood was pretty messed up. 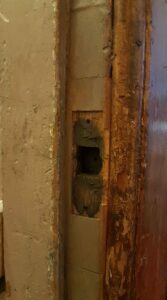 To get started, I needed to square up the cavity so that I could fit in a wooden patch. As there are two levels of cavity, I had to glue in two different patches to fill the space. 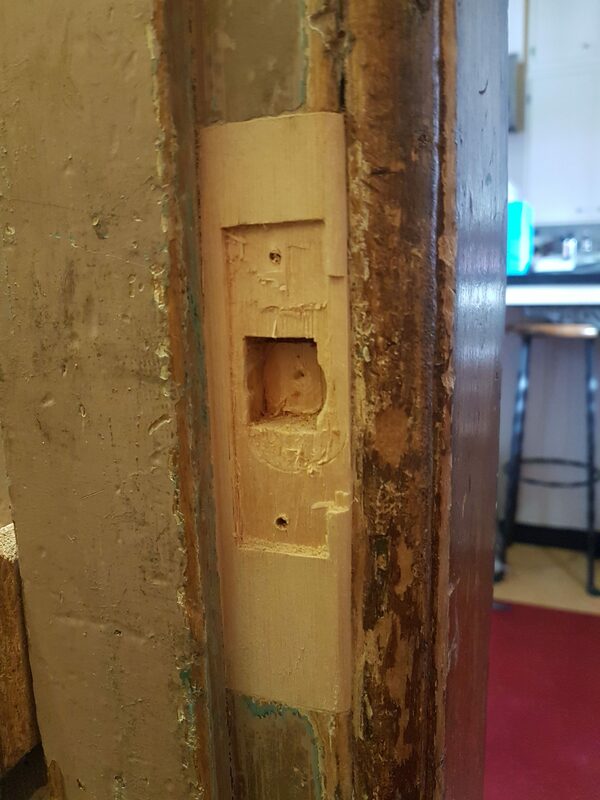 As with the door mortise, I used antique pine from my breaker pile. 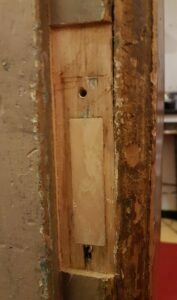 First was the deeper cavity – I glued in a patch and then trimmed it flush. I also enlarged the repair area upwards. This is to fix the damage visible near the top of the above image. I then glued in a second larger thinner patch to fill the remaining space. 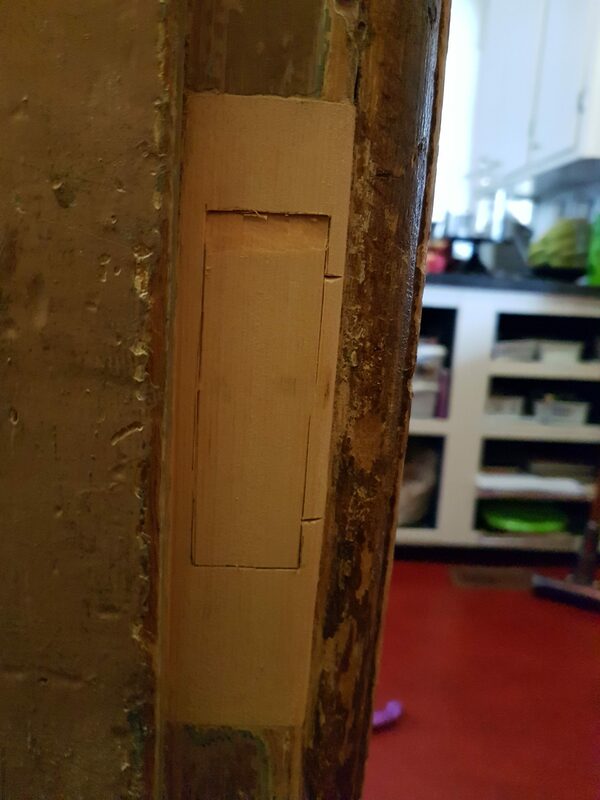 Once the glue had dried, I trimmed the patch flush with the original wood and formed the front edge to match the existing edge. 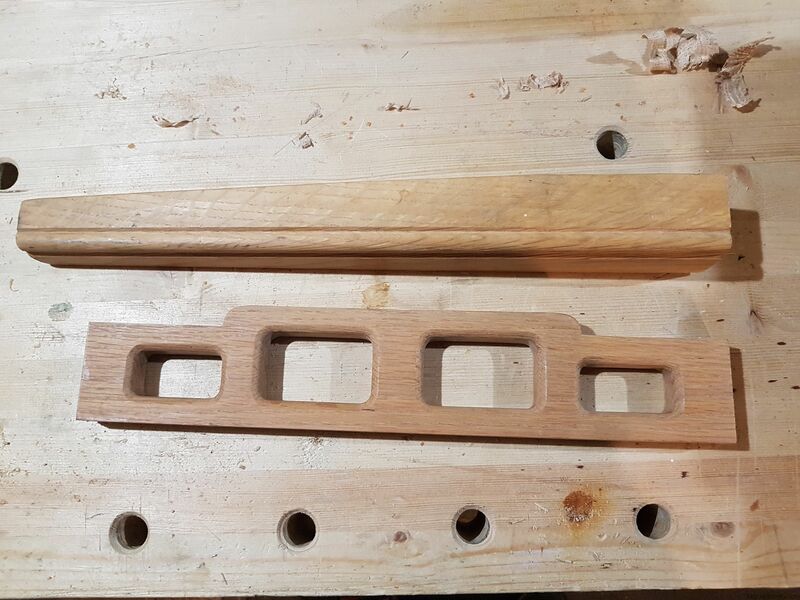 Next was to mark out the position of the strike plate and form a mortise to fit it. I measured for the screw locations and pre-drilled them. 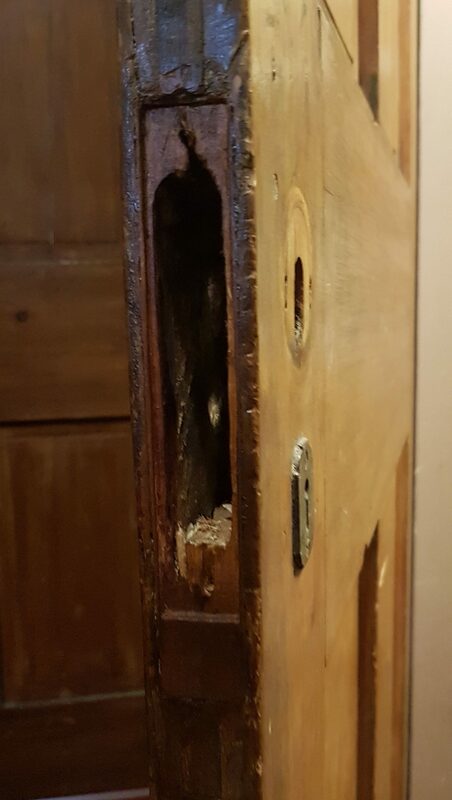 At this point the wood was ready to put the strike plate back in place but the new wood was painfully obvious. 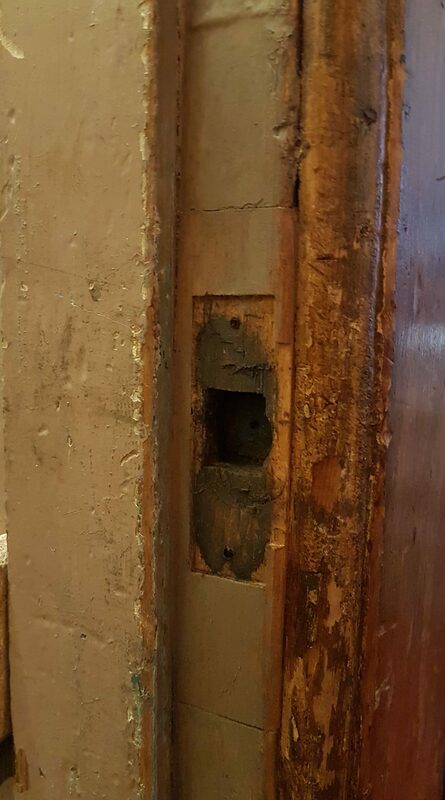 Using a combination of shellac, dyes, and earth pigment to make the new patch blend into the existing door frame. 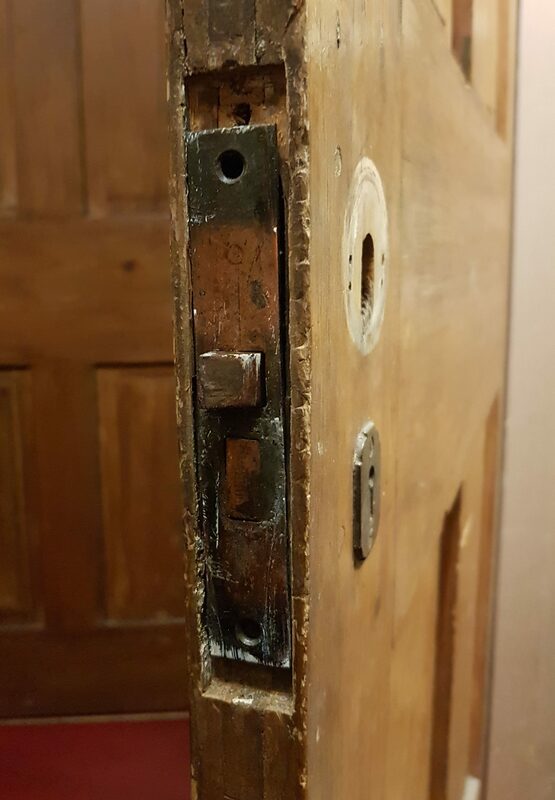 The idea is not to make things perfect but rather to make it look like it has been used and abused for the last 130 years as is the case with the remainder of the door frame. 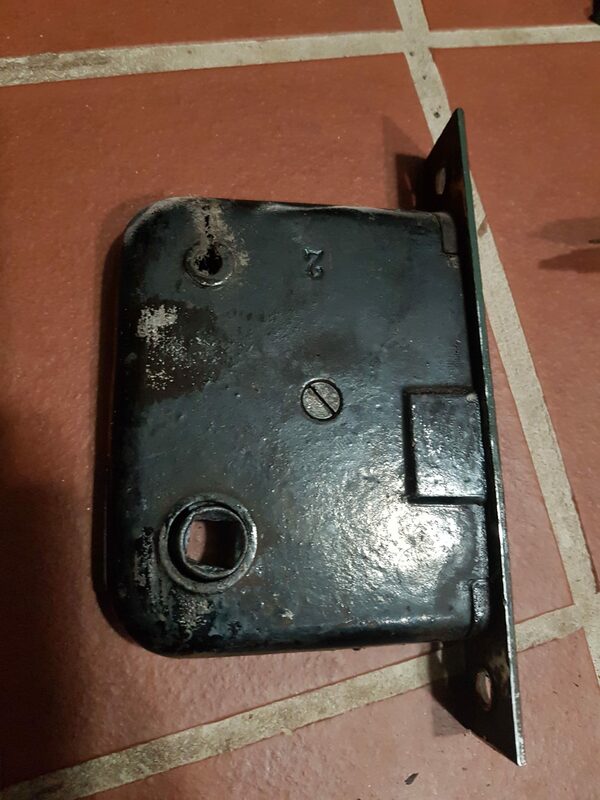 Finally, I put the original strike plate back in place. I think I was pretty successful. Amelia was unable to tell where the patch began and ended. 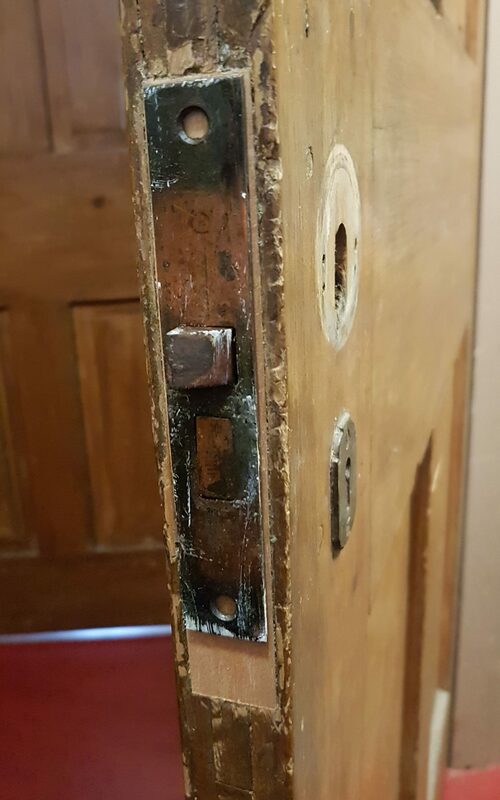 Undetectable other than the fact that the door now works properly. 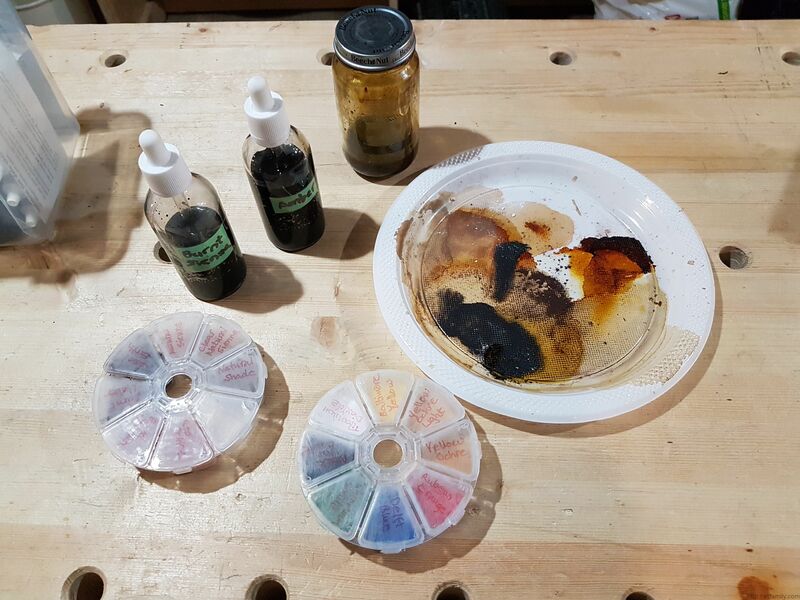 I mentioned earlier that I use a combination of shellac, dyes, and earth pigments to recreate the finish and patina of the original components. Here is the setup that I use in doing that work. The shellac is in the baby food bottle. I pour a bit out onto a plastic plate which I then color to the needed tone. The dyes are in dropper bottles that I can use, as needed, to adjust the base color. I then add in powdered earth pigments to adjust things and provide some opacity that the dye doesn’t allow. 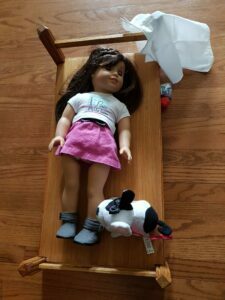 Recently, my youngest daughter turned 9. 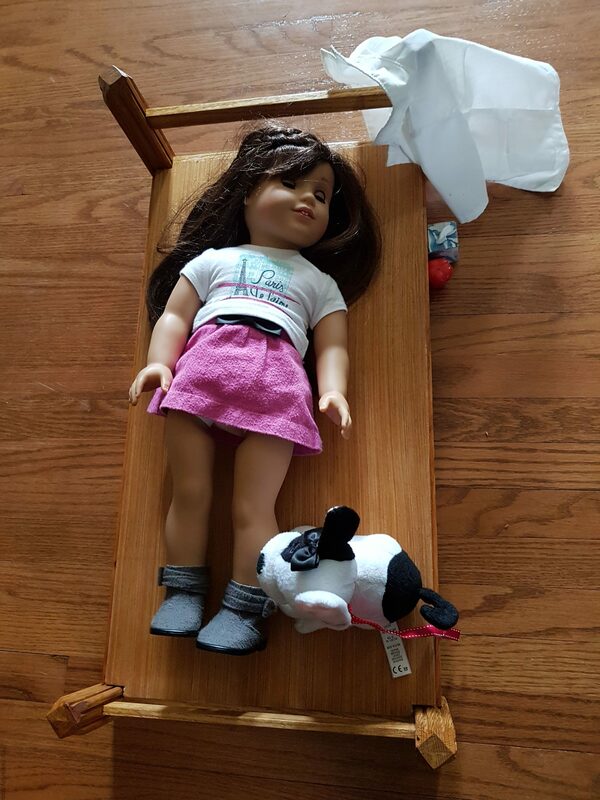 One of the things on her list of requests for presents was a bed for her American Doll, Grace. I’m sure that these things are available for sale but I wanted something more personal. It seemed like a great chance to build something using some of the scrap pieces from around the shop. 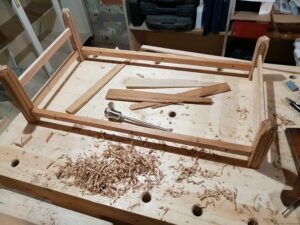 I used the following process to make an Oak Doll Bed. The wood that I used for the project was all oak. I used a combination of off-cuts from other projects and some parts (apron and legs) from an old end table. 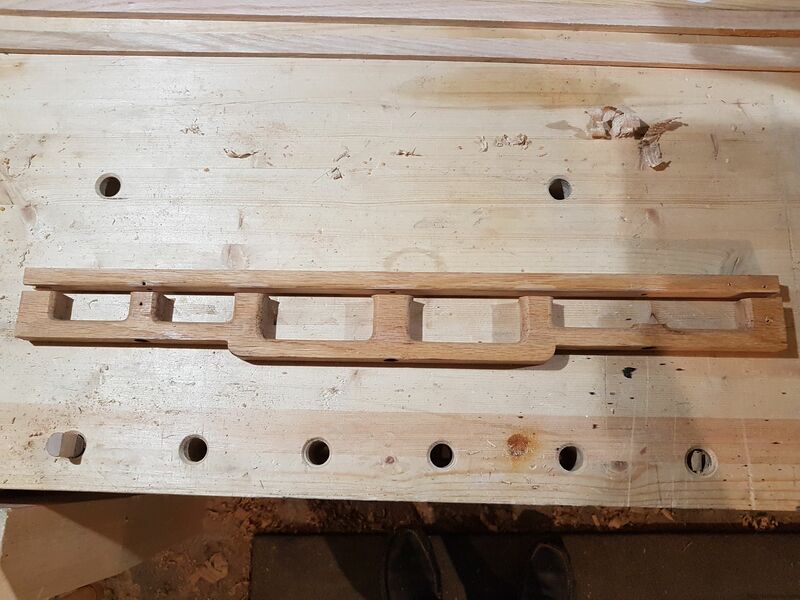 The plan was to create four posts with the head board and foot board stretchers as well as the side rails mortised into it. The side rails were ripped from the aprons. I decided to keep the remainder of the aprons intact as they looked like they could be used later as handles for other projects if needed. I used the table saw and jointer to square up the legs which would become the bed posts. To keep the dimensions as large as possible, I didn’t completely remove the tapers. I’d work the not squared areas into design details later in the process. Finally, I cut the all the posts and side rails to size and got ready to do the joints. As I mentioned, all the joints were mortise and tenon (1/4″ in all cases). 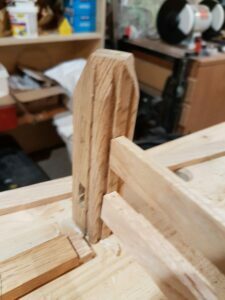 I started by putting 45 degree chamfers on the corners of the top of the posts as a design feature. This was followed by cutting the various mortises after marking them out with marking gauge. 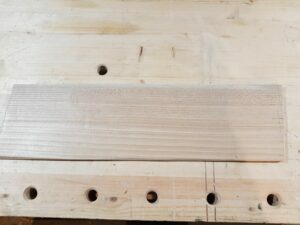 Then, before moving on, I decided to add some 1/4″ beading to the corners of the posts. 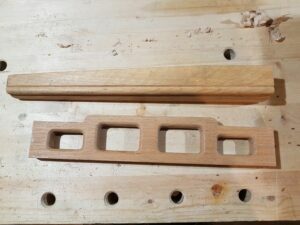 The was probably overkill but gave me a chance to try out my 1/4″ side bead plane. I picked it up at the antique market a few weeks back. After working to tune and sharpen it, I wanted to test it out. Aside from the design feature, there is something sort of magical in watching the profile of the bead appear more completely after each stroke. By alternately running a bead on both edges of each face, I ended up with the desired pattern running all around the post. This was followed by cutting the tenons and tuning them to final size with my Veritas shoulder plane. I have to give props to Veritas here as the plane is wonderful. It is easy to hold, which is not always the case with shoulder planes, and the set screws for the blade make it easy to control side projection of the blade. For some of the smaller stretchers, I didn’t even bother to pull out the saw and just used a knife and the shoulder plane to cut the tenons to size. 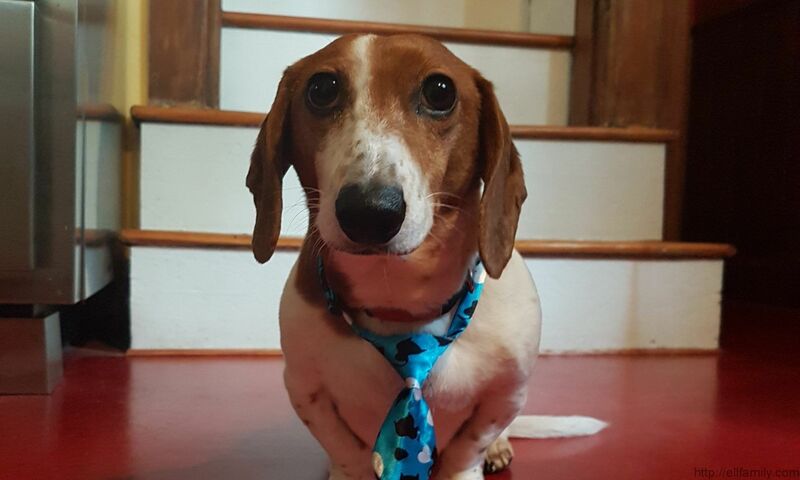 The last step was to test the fit. Things came out pretty well though, with these very small parts, getting things to perfect square can be a bit of a challenge. Even very small errors cause very noticeable problems. Aside from the final outcome, the project was a success in that it forced me to be more careful in how I cut these joints. I think this will serve me well in future projects. It was at this point that I realized I’d need some supports running across the bottom of the frame to hold the “mattress”. I hadn’t actually thought through what to do for that yet though. 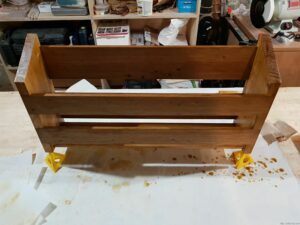 I set the supports into notches in the side rails so that they were flush with the surface. Then it was just a matter of gluing up and clamping. You may also notice some lighter patches along the side rails. 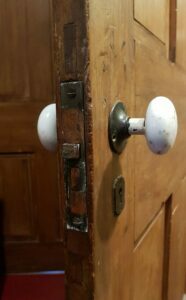 As the wood for these was scavenged from the old table aprons, they had screw holes through them at regular intervals. I used epoxy wood putty to fill the holes as I was doing the glue up. 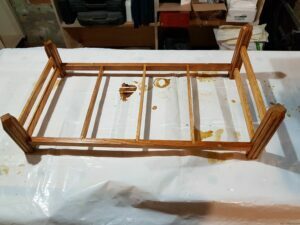 After I had sanded everything and put a coat of orange shellac onto the bed frame, I started trying to figure out how I was going create the mattress. 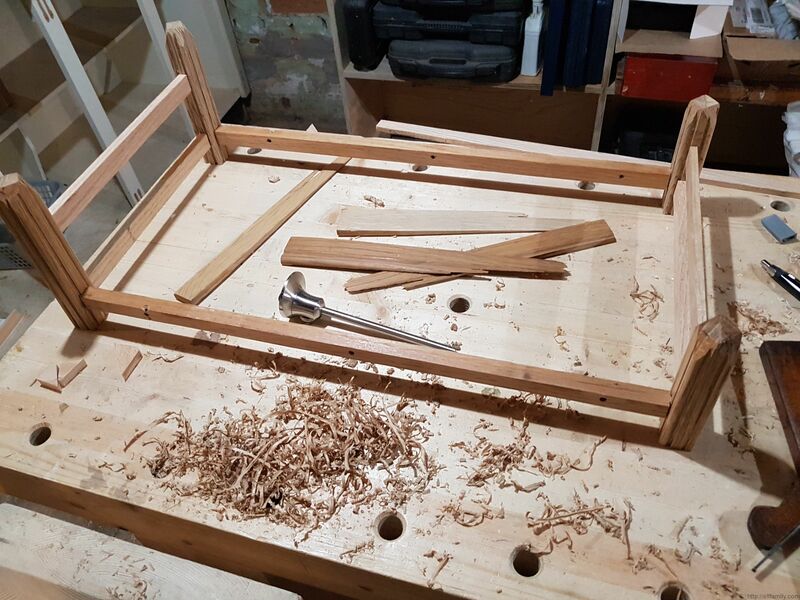 While the 3 middle supports worked well, there was no support at the head and foot of the bed. To rectify this, I took a piece of 3/16″ plywood that I had laying around, cut it to size and notched the corners to fit around the bed posts. I then gave it a quick coat of shellac to help it blend with the rest of the bed. The shape of the piece allows it to drop on to the bed from the top. 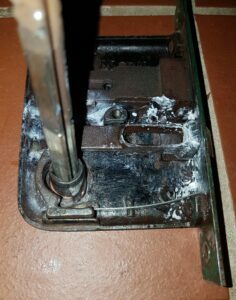 The notches and the bed posts keep the panel in place. I still haven’t figured out exactly what to do for a mattress but this will have to do in the meantime. The final result was a success and Anneliese is very happy to have a bed for Grace now. She seems to be quite comfortable sleeping on it with her pet dog. I love the fact that Anneliese left her an apple and made her a tiny box of tissues. It’s there beside the bed in case she needs to use one during the night. For now, all seem to be happy. I’ll post an update later if I figure out a way to make a mattress for her. 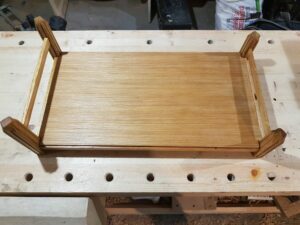 If you’re interested in seeing any of the other woodworking projects that I have posted, you can find them here. Thanks for reading! 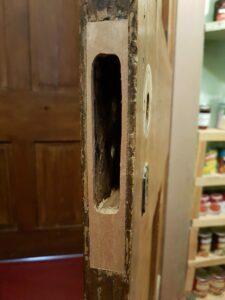 You can find part 1 of the Barrister Bookcase Restoration here. 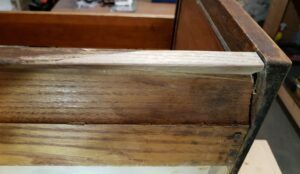 The first piece of work I decided to take on was replacing the missing piece of wood on the front edge of one of the shelves. Luckily, I had picked up a number of pieces of white oak for a couple of bucks each. 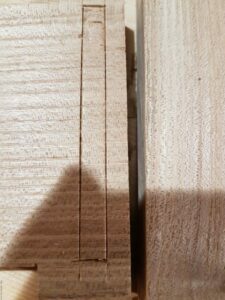 This dimensions and grain just happened to match up nicely with what I needed here. 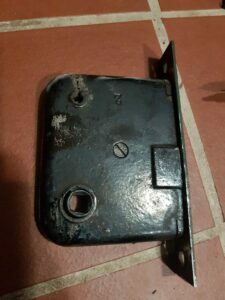 The remainder will also be useful for the creation of the replacement cover frame later. 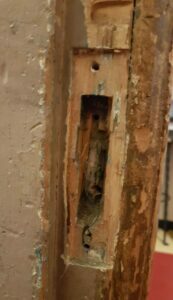 When you are trying to splice in a broken piece of wood during a repair, things will go a lot easier if you can remove ragged edges first. By cutting a flat reference plane at the damage site, it is much easier to shape a replacement piece. So, out came a wide chisel and I formed a flat surface at the break. It probably doesn’t look much different but it is. The flat surface allows me to use a plane to shape a matching surface on the replacement piece of wood. I could use almost any piece of scrap oak if this repair was on the side or back of the shelf. Since it is on the front of the shelf, it is important that the patch not only matches in shape but also follows the grain of the original piece. This will make it much easier to disguise the repair later during finishing. I cut a wedge shaped piece of oak on an angle that attempted to align with the grain of the shelf. 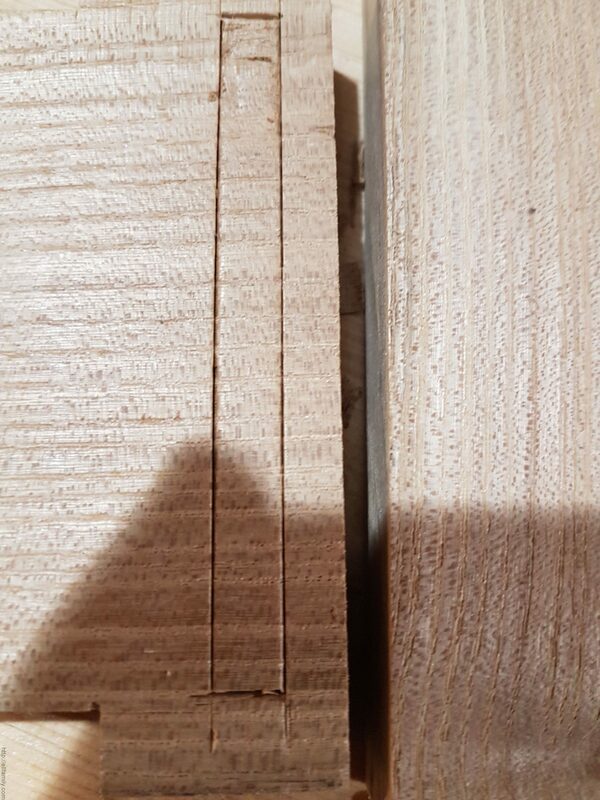 You can see that I was lucky enough to find a piece where the grain has a very similar character to the wood it is replacing. I’m sorry I didn’t take more intermediate photos but I got so caught up in getting things to fit that I forgot. In any case, here is a picture of the roughly shaped patch. At this point, the flat angle on the back of the patch was mating well with the exposed surface of the repair while maintain grain alignment. 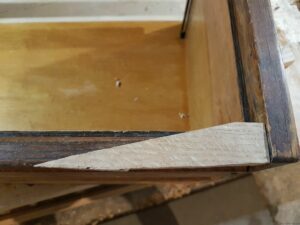 Next step was to glue it into place and begin trimming it to align with the shelf surface. At this point, it is a matter of shaping/carving the patch to blend into the existing wood. 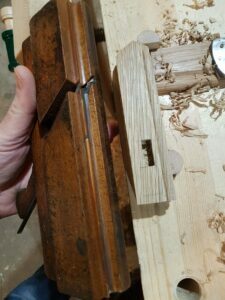 Again, I use a combination of a block plane, chisels, and various rasps and files (conveniently held in my ABS Pipe File Rack). The front of the patch was actually pretty easy to deal with as it is mostly meeting flat surface to flat surface. The outcome looks pretty good and I think the refinishing should hide the patch nicely. The bottom of the patch was a bit more of a challenge. 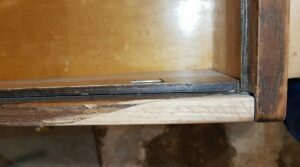 There is a curved cavity under the front edge of the shelves. 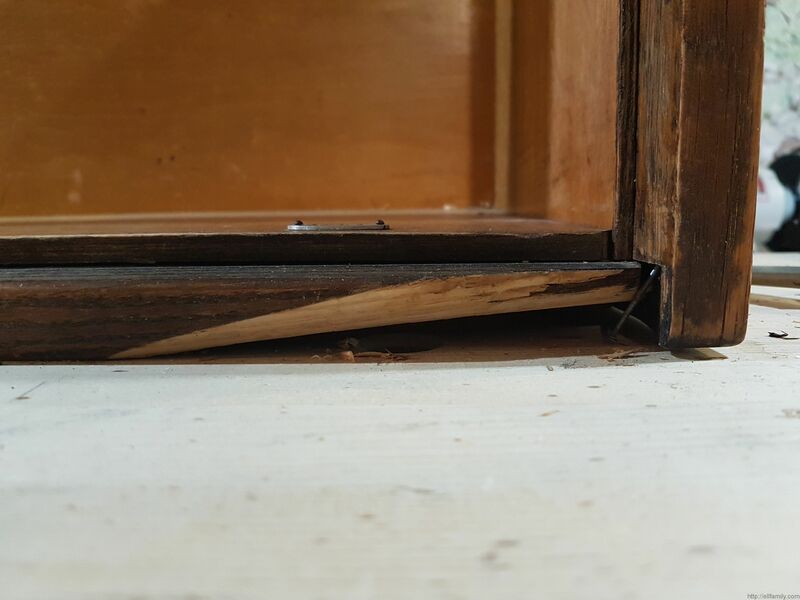 This is to provide clearance for opening the glass front of the shelf stacked below it. As such, I had to do a bit of carving to match the patch to the curve of the shelf to make sure there will not be any interference when it is complete. I know there is a gap but that is only on the underside, it shouldn’t be visible once things are finished up. Quite a few years ago, my wife picked up a set of barrister bookshelves because we needed some shelves for the many books that we had collected over the years. 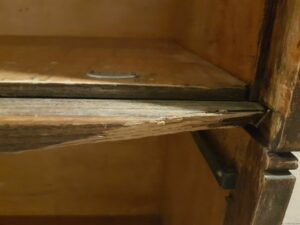 The condition of these particular shelves left much to be desired but were still functional. Only two of the sections actually had covers and, of those, only one with glass in it. Even that one pane of glass is missing a piece. There were also plenty of scratches, cracks, and missing chunks of wood. That being said, the price was excellent and they were still extremely solid so we used them without the covers for years as regular book shelves. As we’ve started to clean out some of our library, we’ve found that they aren’t needed anymore so I thought I’d take the opportunity to do a barrister bookcase restoration to get them ready for sale. Barrister bookcases are a specific kind of bookshelf characterized by their modular nature. Each shelf, as well as base and top, are individual sections. As such, you can stack as many or as few together to build shelf of the size that is needed. This has the added advantage of making them portable. Each section is quite compact and light making moving less of a chore. In fact, the original design came out of a need to move books in an efficient manner. The individual shelves could be moved as is without even removing the books. A second defining feature is the presence of a glass cover on each shelf. These covers lift up and then slide in over the top of whatever is on their shelves. 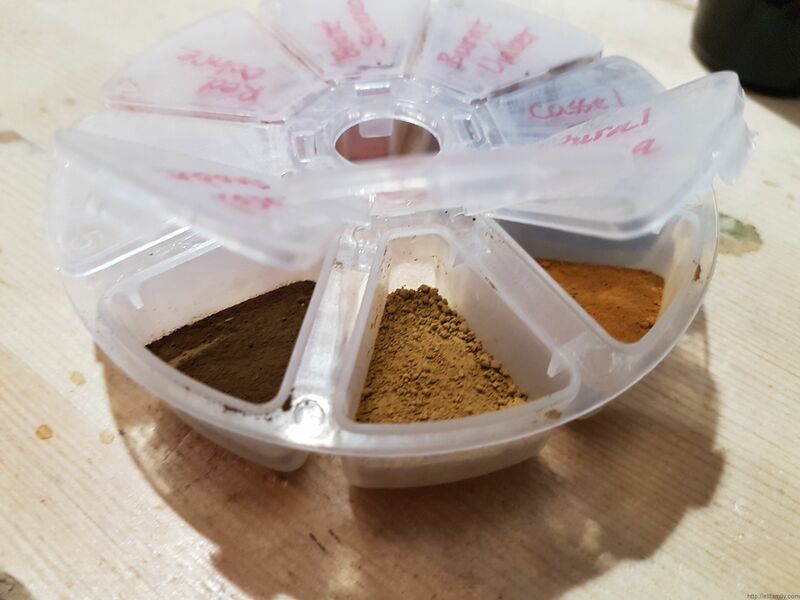 This provides protection for the contents from dust and helps keep the shelves looking tidy in general. First step is to have a look at the various issues that will need to be addressed. As I mentioned, only two of the original 3 covers survived so I will have to build a third cover to complete the set. In addition, the glass will need to be sourced for all three as even the one that has glass is missing a piece in the corner. 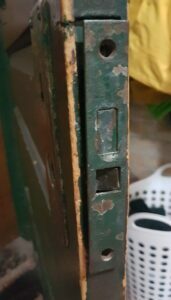 There are some additional problems with one of the shelf unit’s hardware. The runners for the cover appear to be missing. You can see in the pictures below there is a metal rail for the covers to ride on for two of the shelves. 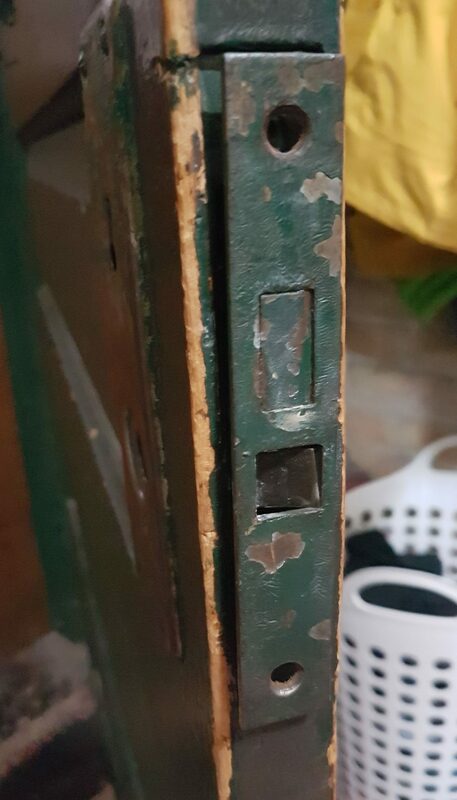 On the third one, there is only a strip of wood present. 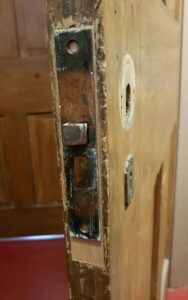 It is possible that this third one is older and the wood is original while the metal slides were only introduced later. Given the three are currently together in a set, I think it makes sense to try and recreate a third metal slide here if possible. I’ll have to think more on this one before undertaking it. 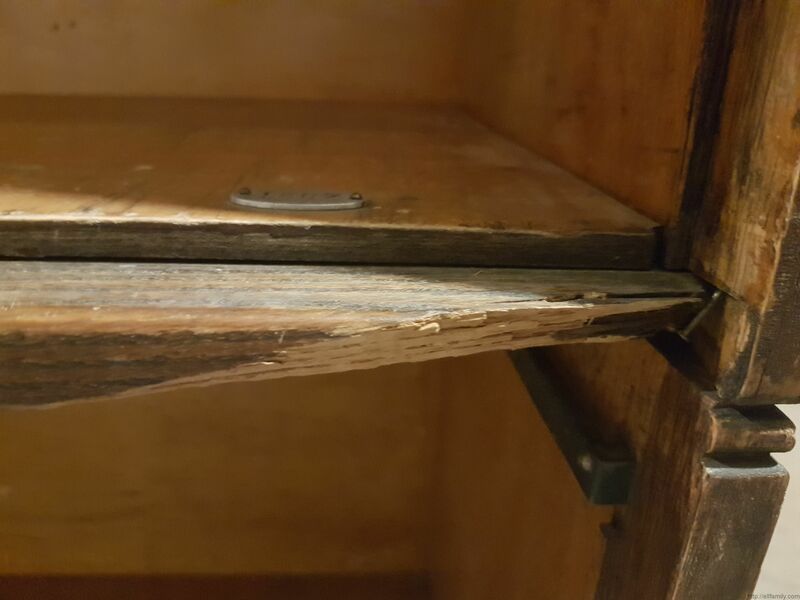 The next challenge is the damage to the front edges of a couple of the shelves. One is only cracked and can be glued back together followed by a bit of finish work to hide the split. The other is actually missing a significant chunk of wood. I’ll have to patch in some replacement wood and try to blend it in so it’s not so noticeable. There is a significant stain on the top that I will try to bleach out and refinish to make it less of an issue. 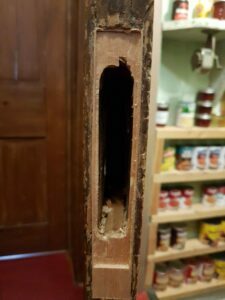 The finish on the faces of some of the shelves has been damaged. I’ll address this as well. Should be an easier fix than the top I think. Finally, there is a general mismatch in the finish on the sides of the three shelf sections. The grain and finish is very different for each section but they all look like oak. They may have all came from different production runs and later been put together as a harlequin set. I’m actually not sure that I’ll attempt to do anything with this. The finish on the darkest shelf is badly orange peeled. I may strip the sides of it. I’ll see if I still have energy for it at the end of the restoration. Part two of the restoration can be found here. This is part 3 of my ABS pipe file rack build. You can find part 2 here. After looking through my scrap pile for an appropriate sized piece for the bottom of the rack, I found another section of Chinese elm that I could use. It was just long enough to use once the ends were squared off. I ripped a 5/8″ strip off one side to use as a lift strip to keep the tubes up off the bottom. If that doesn’t make sense now, you’ll see it better once it is complete. 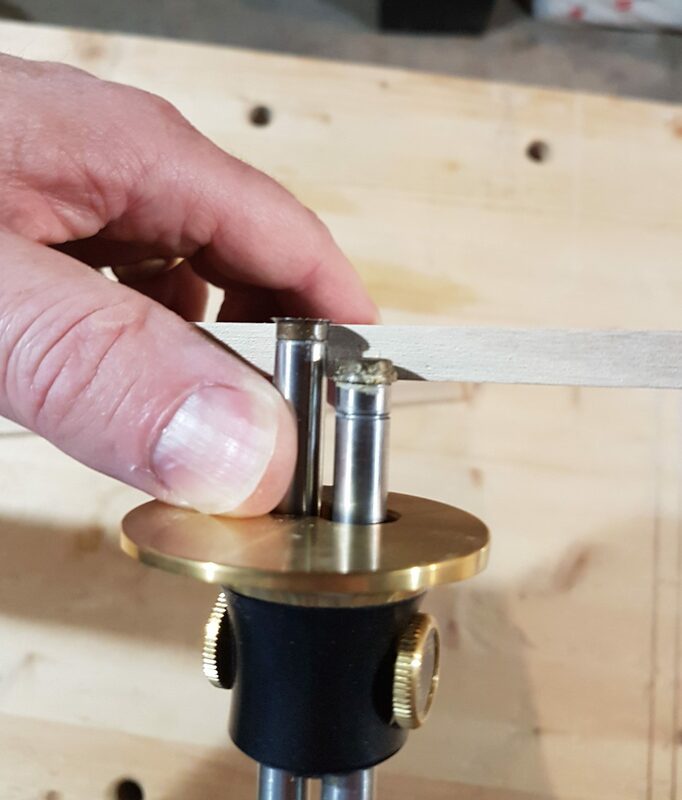 I started by taking a measurement for the slot off the bottom piece using a Veritas Dual Marking Gauge. I then use a wide chisel to further define and deepen the outline of the slot. 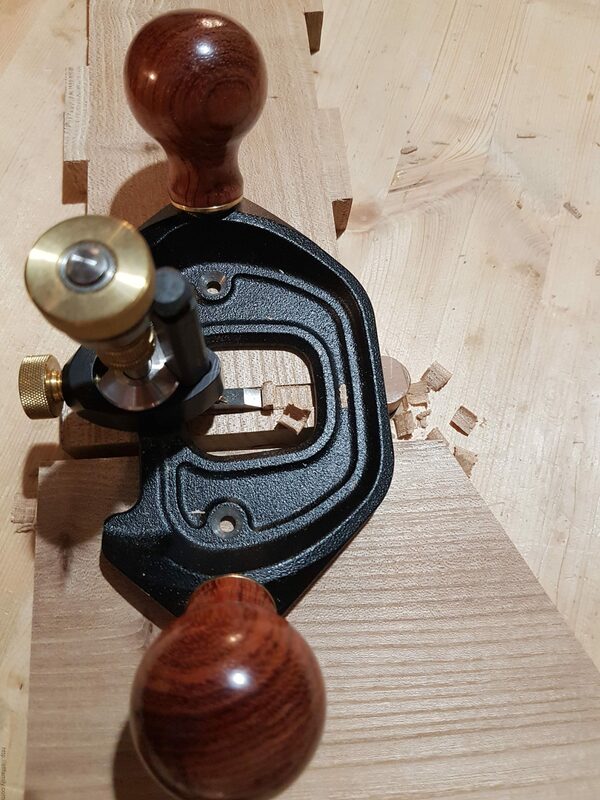 At this point, I can use my beloved router plane to clear out a layer of wood. 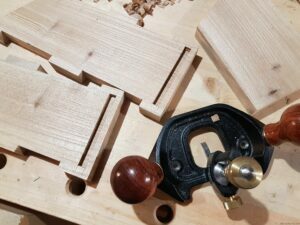 This cycle of chisel to router plane is repeated until I reach the desired depth. 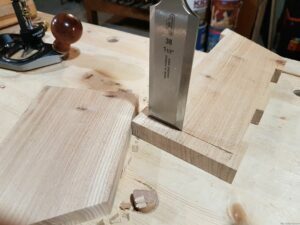 I suppose that I could use a chisel to hog out more wood in a single pass as I do with a dado but I find it hard to control. The router plane takes a bit longer but the end results are much cleaner. More for practice than for need I decided to put the lift strip in a groove in the bottom. To do this I marked out the edges with a knife and then ran the router plane down to make the grooves. 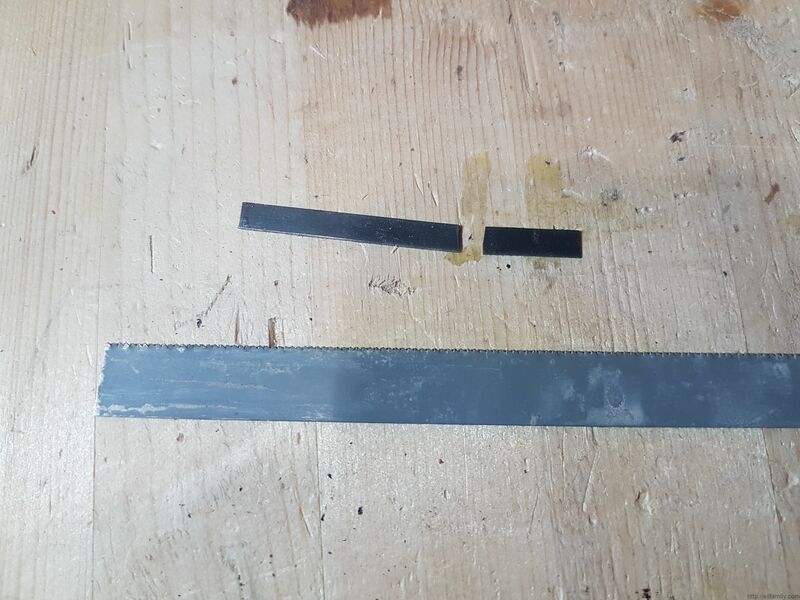 I was then able to glue the strip into the groove, ready for final assembly. 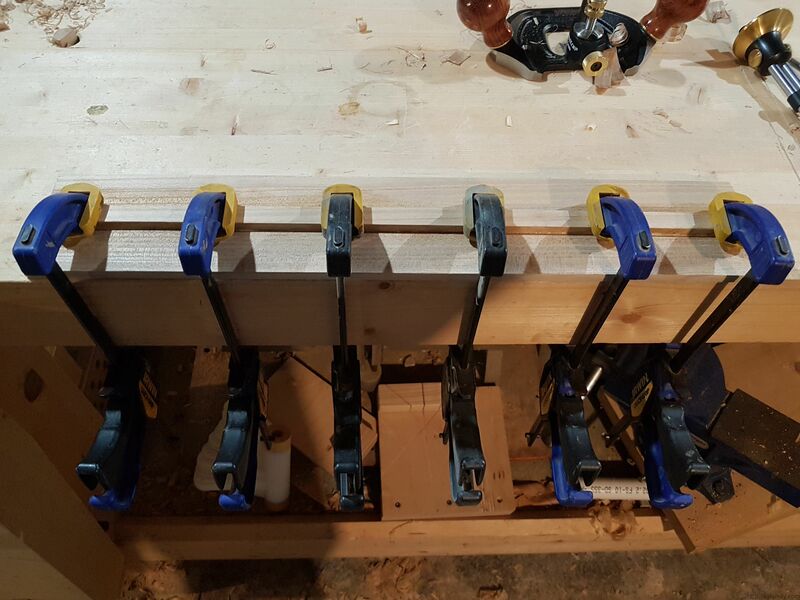 As everything is sitting in slots or notches, I simply needed to glue the joints and clamp everything. 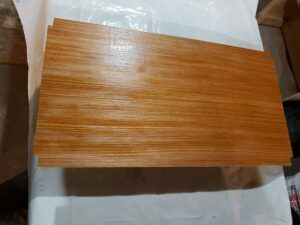 To finish up, I trimmed the ends of slats flush and put a coat of orange shellac over the entire file rack. Finally, I fit the ABS tubes into place and filled them up with the files and rasps. 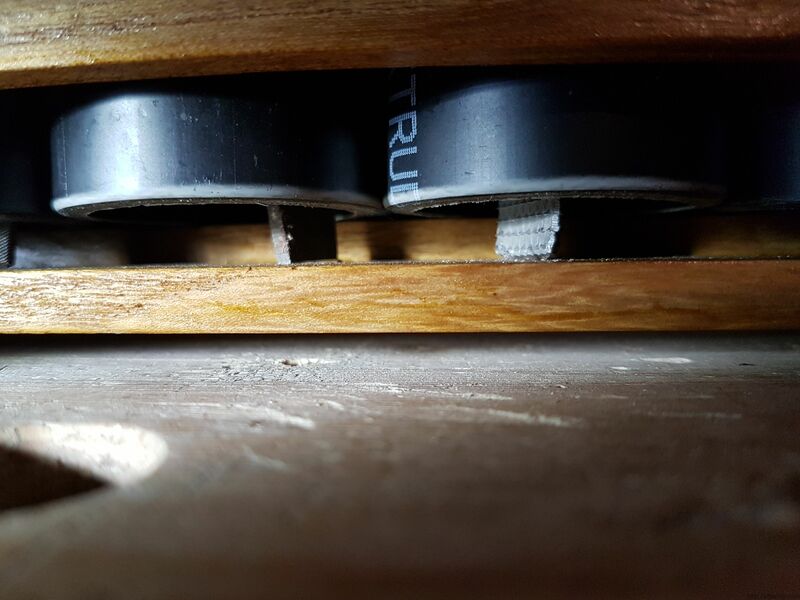 Here is a close up of how the lift strip on the bottom holds the tubes up. This allows any dust on the files to clear the tubes rather than collecting in their bottoms. Hope you enjoyed it – thanks for reading! You can find part 1 of the build here. This is part 2 of my file rack build using ABS tubing. You can find part one of this project here. My design for the file rack is to contain the ABS tubes with two solid end pieces attached by strips at front and back. These strips will sit in notches in the side pieces. At the bottom will be a flat panel with a set of 3 small strips running lengthwise across it. This will provide support for the bottom of the tools. It will also have a gap where saw dust and such can escape the bottom of the tubes. I started by laying out the notches. No measurements here, just laying things out so they look good. I made my marks directly from pieces using a knife and a Veritas marking gauge. The lines are a little hard to see but here they are cut in below. 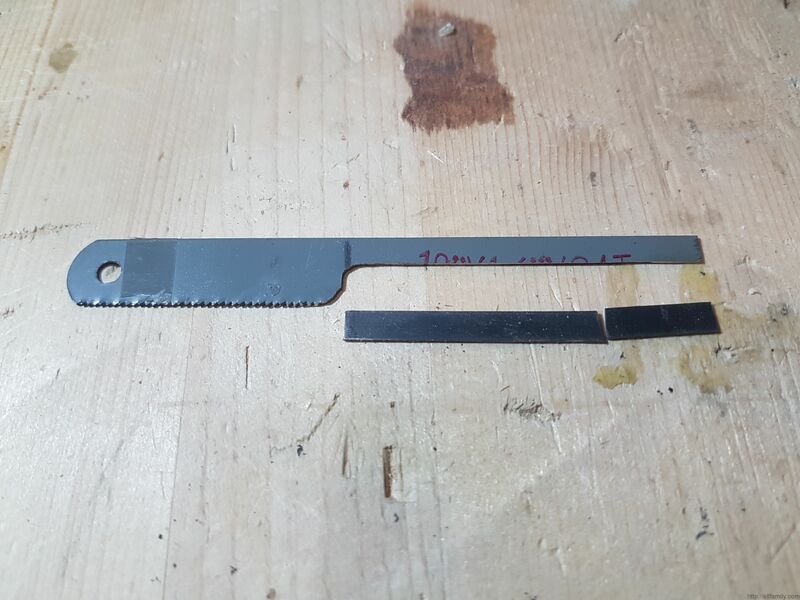 Given that this is just a utility piece, I could go straight to the saw now. However, I like to take advantage of a chance to practice my “first class cuts”. I do this by taking a chisel to cut a trench to the waste side of the knife line that forms a trench for the saw to ride in. This helps to keep the edges of the joint crisp and clean since they will be visible in the finished piece. As I mentioned, the Chinese elm is not working as well as I’d hoped. You can see that even with the knife and chisel work, the edges are not particularly clean. A quick cut with a back saw forms the edge of the notch. I put a couple more kerfs into the waste section and then use a chisel to clear the bulk of the wood. It’s important to work from both sides here and at an angle moving up and away from the base line. The result is a slight ridge in the center of the waste. 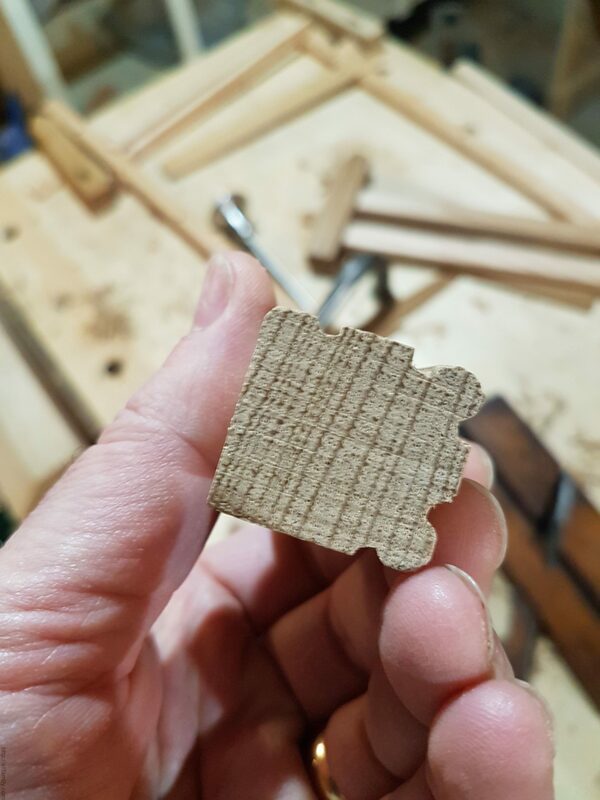 This can be subsequently removed and smoothed with a router plane. Note that I’ve clamped a second piece next to the one I’m working on. 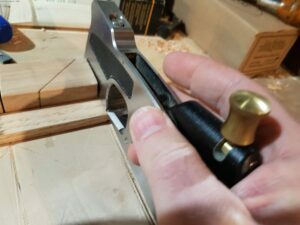 This provides the needed support for the base of the router plane when bridging the notch. In this case, I was using the other side but any offcut with a straight edge will do the trick. A quick check of the fit of the notches. You can see the checking that I talked about in my earlier post. Doesn’t look great but this is for the shop and shouldn’t impact the function. Finally do a dry assembly to check things. The tolerances are tight enough that it holds together by friction until I insert the tubes, then I needed clamps for support. Next steps are to build the bottom, assemble the file rack, and put on a finish of some sort. Over the years I have amassed a number of files and rasps. 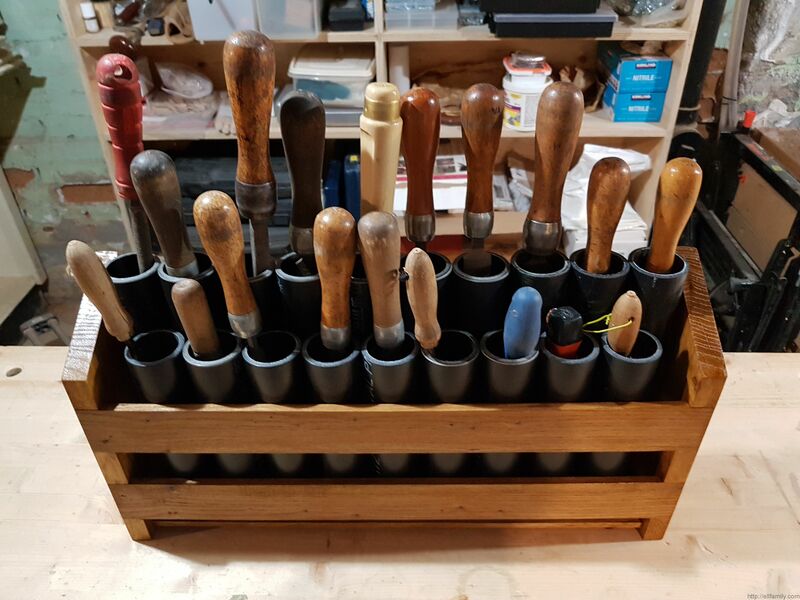 Since storing these tools loosely together damages their cutting edges through contact, I had been storing them in old wine boxes. I used the separate compartments in the boxes to hold one file each. It achieved the desired outcome but was neither efficient nor elegant. I finally decided it was time to make a proper file rack for them. After spending some time looking around at different options, I settled on something that looks like an over-sized spice rack that uses ABS pipe to compartmentalize the files. In hind sight, I could also have used PVC, which may have been a bit cheaper, but I already had some ABS in hand so went with it. Here’s the build process I used. The first thing I did was to cut the ABS pipe into lengths. For this I used a large Rigid No 133 pipe cutter that I picked up off Kijiji a number of years ago. It is basically a giant version of the pipe cutters commonly used in plumbing for cutting copper pipe. I think that I actually sourced it to do some plumbing but, once you have one of these and realize the number of things you can use ABS and PVC pipe for, the sky is the limit. Using a pipe cutter insures that your cuts are always square and finished looking – things that are not always true when cutting with a saw. And so began the cutting to break down the 6′ lengths of 1 1/2″ ABS pipe I had. Given the range of files and rasps I had to deal with, I planned on two layers of pipes. The back row is 10″ long and the front row is 8″. After some time spent on cutting I had 19 tubes ready to go. 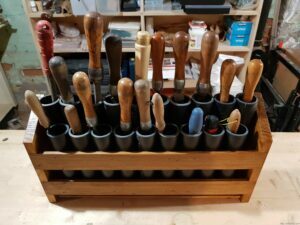 One of the reasons that I had put off building this file rack for so long is that, for some reason, I was obsessing about the type of lumber I would use for it. 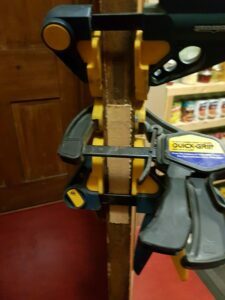 I was originally thinking about building it out of cherry or butternut, both of which I have some planks of sitting in waiting. Given the utilitarian nature of the project, I’d save these nicer woods for a project that will be more visible. However, a few years ago we took down a number of Chinese Elms from the back yard that had come end of life and were constantly dropping branches, mostly onto our neighbor’s roof. I split a few lengths of trunk and set them aside to dry. The wood isn’t as nice as I’d hoped but will work for things like this so I grabbed a chunk to use in this project. A bit of time with the band saw, jointer, planer, and table saw and I had wood for the sides prepared. 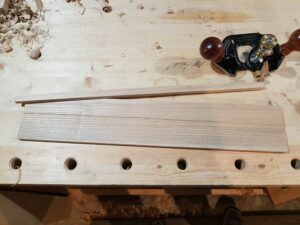 The ends of the long pieces have a bit of checking but because its utilitarian project and the joinery should help with any further splitting, I’m not going to worry about it. I still have to figure out what to use for the bottom of the file rack – haven’t decide whether to put in a piece of plywood or mill another chunk of the Chinese Elm. 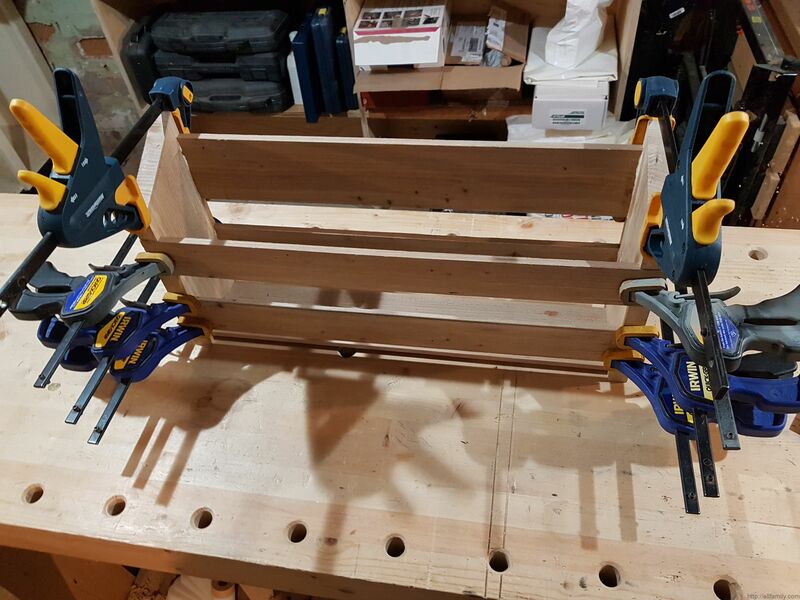 In the next entry, I’ll cover cutting the joints and putting the file rack together. Part 2 of the build can be found here. In the first part of this blog post, I covered the prep of the wood and cutting the rabbets and dados for the medicine cabinet build. This part will cover the adjustable storage shelves, assembly and installation. To make the space a usable as possible, I wanted to have adjustable shelves in the medicine cabinet. I considered a number of different mechanisms for this but, in the end, settled on using holes and brass pin supports. Making the holes for the support pins is pretty straight forward. The old trick of using peg board as a template works great. 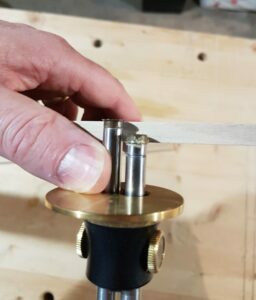 Clamp it in place and start drilling with a 1/4″ bit. I can buy bags of the shelf pins from Lee Valley that are inexpensive and work well. 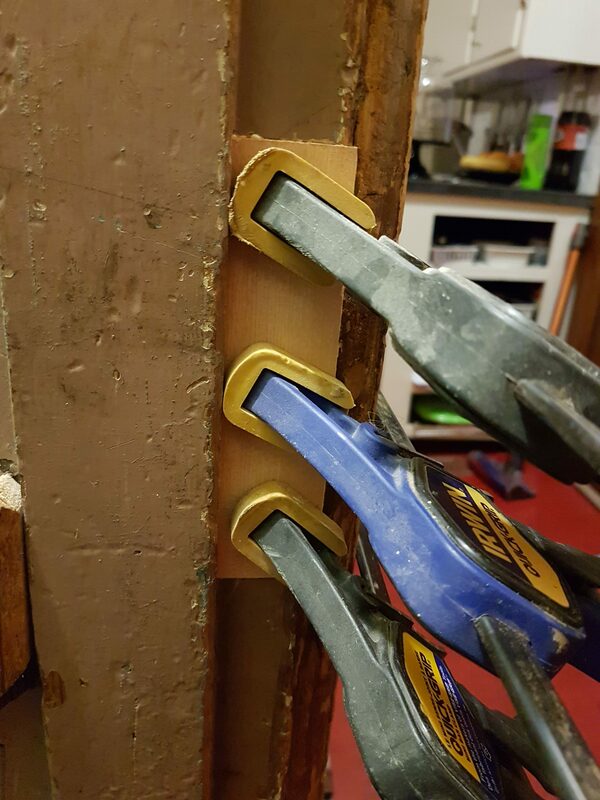 For me, the holes in the peg board are actually too close together and so I only use every second one. Because the backside of the case will not be visible, I was able to just drill through. If the back of your project is exposed and you are worried about breaking through, consider some sort of depth indicator for your drill bit. Making the shelves should be a straight forward as cutting to length and painting but, in reality, it was not so simple. One thing I neglected to mention earlier is that the closet opening that I am working to is not square. This isn’t in any way unusual – just one of the everyday challenges that go with a century home. Most owners, including myself, prefer to call it character. In any case, the intention of the build was to make it look like it had always been there as part of the original house. As a result, I was forced to build the case out of square with the top being about 3/8″ wider than the bottom. As a consequence, to avoid having gaps at their ends, the shelves had to decrease in length from top to bottom. 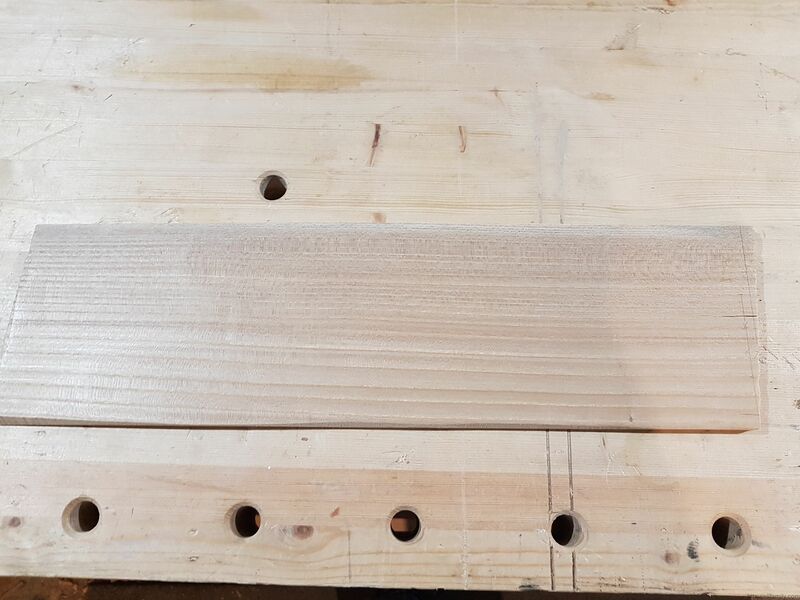 Here are all the shelves laid out, before and after, for priming on my work bench. After priming I marked the back of each shelf with Roman numerals from top to bottom. This ensured that I would be able to keep the shelves in the right order when they were installed. Roman numerals were designed to allow a straight chisel to cut them so they are easy to execute. I also used the tang end of a triangular file to imprint an indicator of which side was up on each shelf. Not very pretty but are on the back which will not be visible when installed. I gave them a couple coats of paint to finish them off. With all the pieces ready, it was time to assemble the case. The case fit into the opening with a nice firm pressure fit. As I mentioned, the closet opening was not square. I first assembled the sides and shelves with nails and glue and pressed it into place while wet. I left the back off, however, to allow it to conform to the shape of the opening. The resulting frame was distorted exactly out of square in the same way that the opening was. 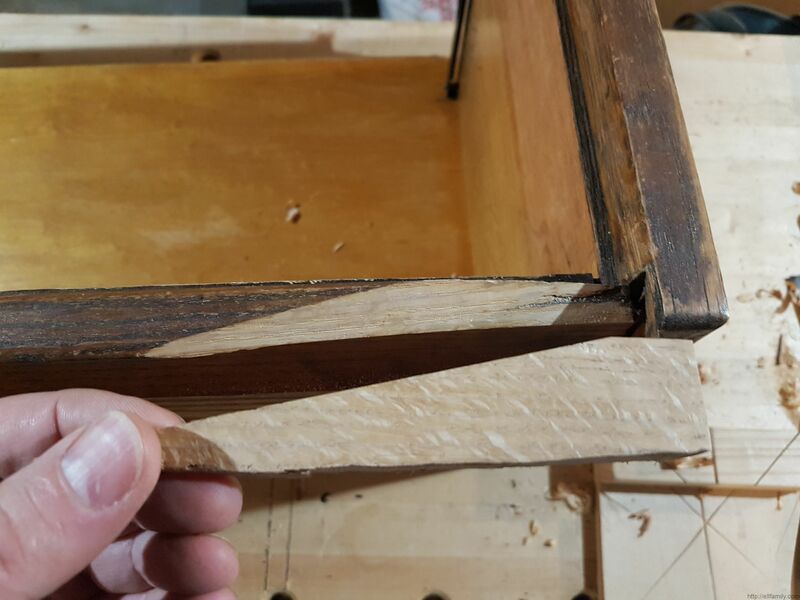 Once removed from the opening, I fitted a piece of 1/4″ plywood into the rabbets at the back, taking into account adjustment for out of square. I realized at this point that I had neglected to address the gap below the bottom shelf. A quick trip to the discards pile produced a piece of painted pine suitable for the job as a toe kick. 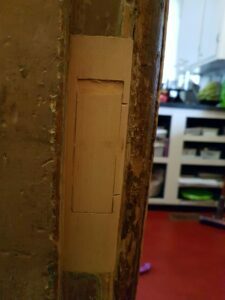 The whole thing then slide back in place with hardly a gap between the cabinet and the door stop of the closet opening. Despite the slight out of square condition, the joints still looked pretty good. Getting near the finish line, I just had to paint the case. A quick coat of primer followed by a couple finish coats did the trick. At this point, it looked pretty much like it had always been there. The only real give away was how clean and fresh the new paint looks – time will take care of that. I should mention one of the minor, but painful hiccups in the process. As you can probably imagine, the multiple layers of paint affect the diameter of the shelf support holes. 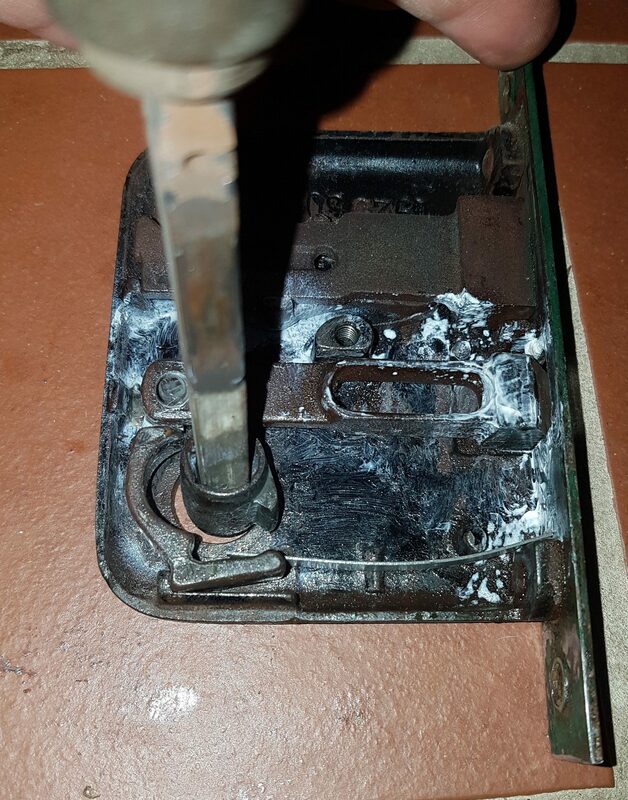 It was then impossible to insert any of the support pins into them. The back row of holes was also quite close to the back of the cabinet. 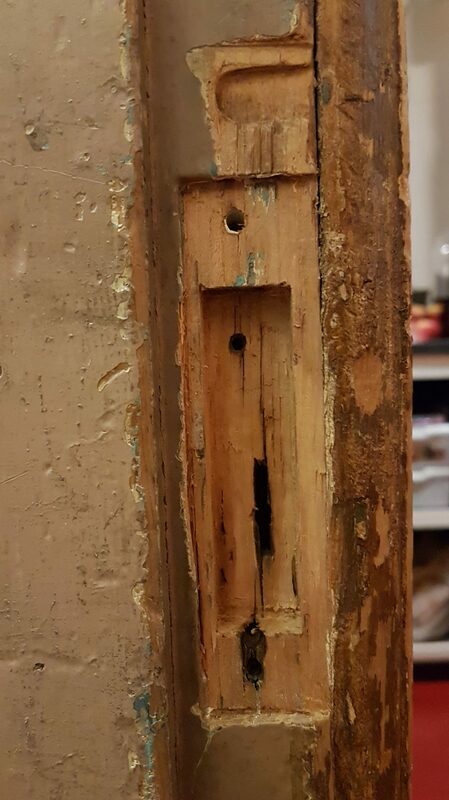 This made it impossible to use a power drill to re-drill. I reamed out the holes using my hands and a 1/4″ bit. There are a lot of holes and drill bits have sharp edges. It is something I’ll have to rethink if I do this again. Perhaps paint the side panels ahead of time so I can ream them with a drill instead? In the end, all is good and we’ve created usable storage space where none existed before. Part 1 of this build can be found here. Older homes like ours (built in 1886) often present challenges around storage space as they often do not have the type or volume of storage space that are common in modern builds. Sometimes, even when space seems available, it can be an illusion. Take, for instance, one of the closets on our second floor in between the master bedroom and the girls room. Looks great – access to storage just outside the door to two of the bedrooms! Unfortunately, when you open it up, you realize things aren’t quite what they seem. It turns out that the space behind this door is only, at best, minimally useful. A previous owner had built a closet into the girls room by utilizing this space so it is not a complete loss from a storage point of view. 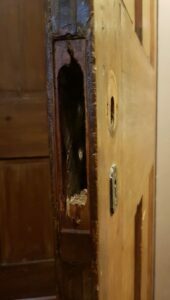 The raw cedar that you can see in the pictures is the outside of the closet box from their room that cannibalizes the space from the original closet. So, what to do? 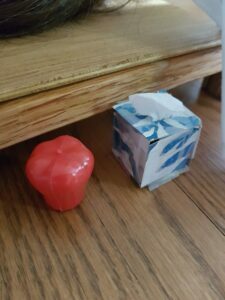 With only about 5 inches to play with from the surface of the cedar box to the front of the closet door stop, there weren’t a lot of options. Still, rather than write it off, I decided to utilize the space to make a large medicine cabinet. The shallow depth becomes a benefit as it makes it easy to see what is what when there are a lot of small bottles and boxes being stored there. The first step was to prep some lumber for the job. I have a lot of pine boards laying around as the result of some significant work that I had to do in replacing balcony decking that the previous owner had installed inappropriately. I’m a huge fan of using reclaimed lumber so, rather than throw stuff out during demolition, I hang onto anything that may be useful. 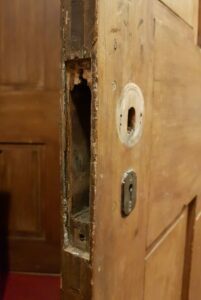 While their condition certainly made it challenging to re-use them for anything stain grade, they were a fine option for the medicine cabinet, which would be painted. 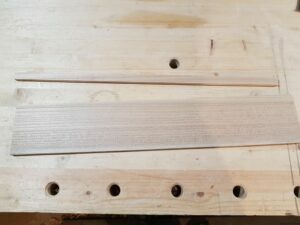 After a couple of hours of jointing, planing, and cutting to size, I had the stock ready to go. 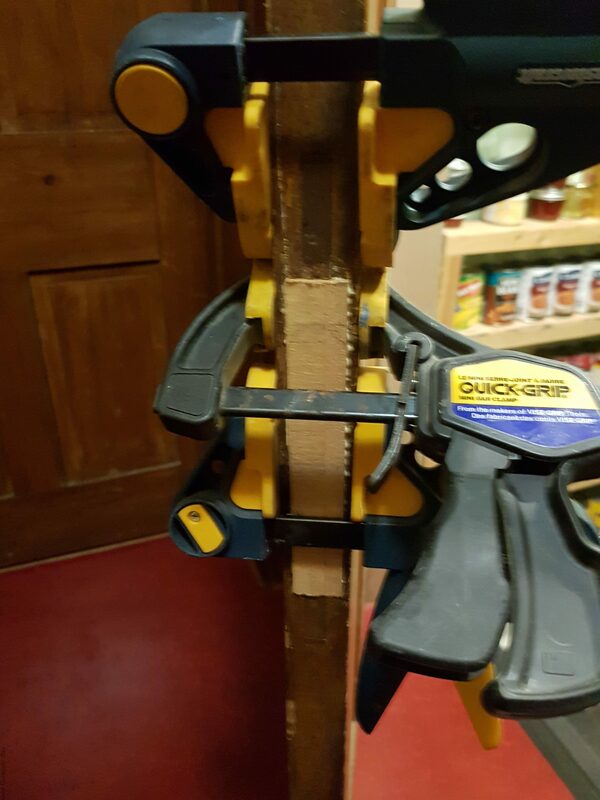 If you wondering about the clamps, when I know that I won’t be assembling things right away, I like to clamp the stock to limit any warping. I’m not sure that it actually makes a difference but, in my mind at least, I feel better about it. To round things out, I did need to pick up a sheet of 1/4″ plywood at the box store. Again, no need for anything fancy as it would ultimately be painted. The structure of the case is pretty simple. The top sits on rabbets with midpoint and bottom shelves sitting in dadoes in the side panels. The back would then fit into a 1/4″ rabbet cut into the back of the sides and top. I start with cutting the sides to length. 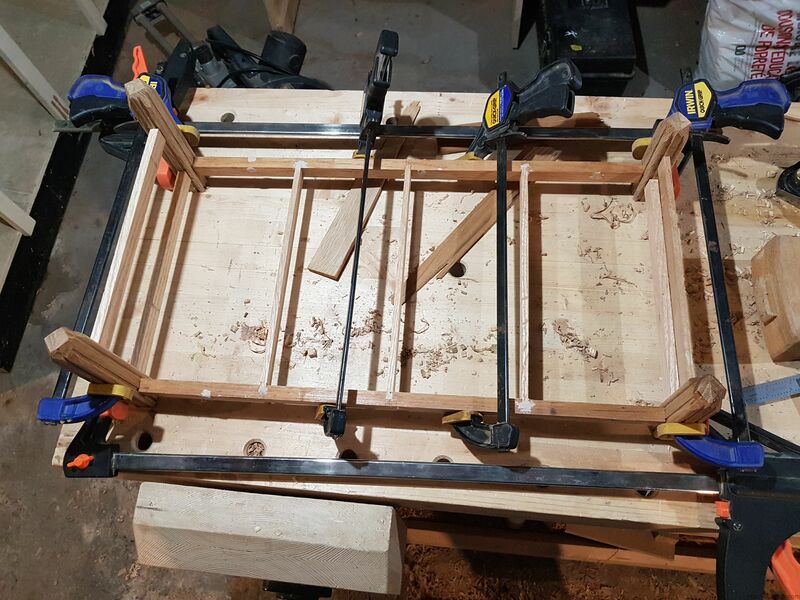 The next step was to clamp the sides down and run the rabbet into their back edge. To do this, I pulled out my handy dandy Stanley 78. 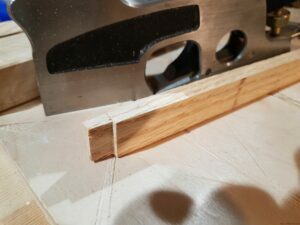 This is a straight blade rabbeting plane that just works. Worker examples like mine can be had for not much money from antique dealers or ebay. You can read more about them on Patrick Leach’s excellent website. 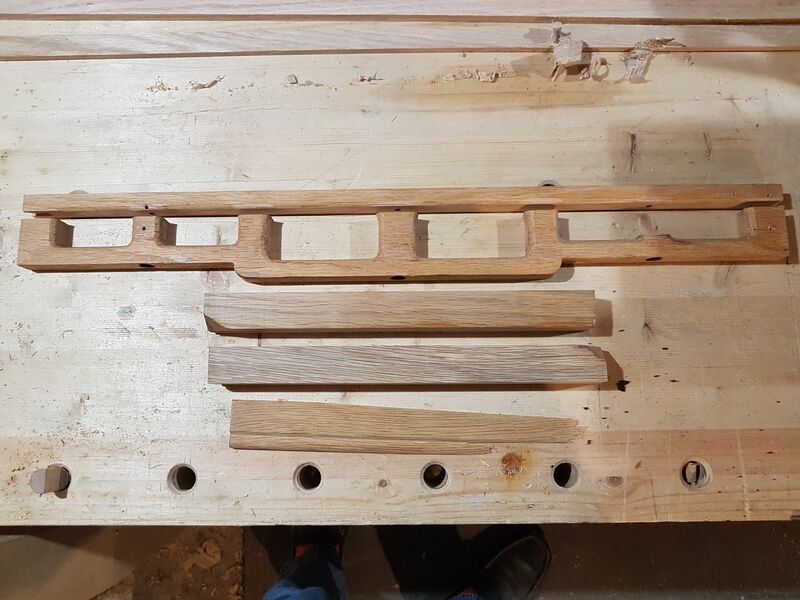 So it would seem that I have my game together – using reclaimed wood and reconditioned Stanley planes to keep costs down. However, I’ve not always been this conscientious and, in my past, have fallen prey to the siren song of the new, shinier offerings in this space. As a result, I also have a left and right pair of the excellent, though not cheap, Veritas skewed rabbet planes. With the 78 around, they have actually seen almost no use since I got them. However, running long rabbets in pine seemed like a perfect time to pull them out and get them into service. 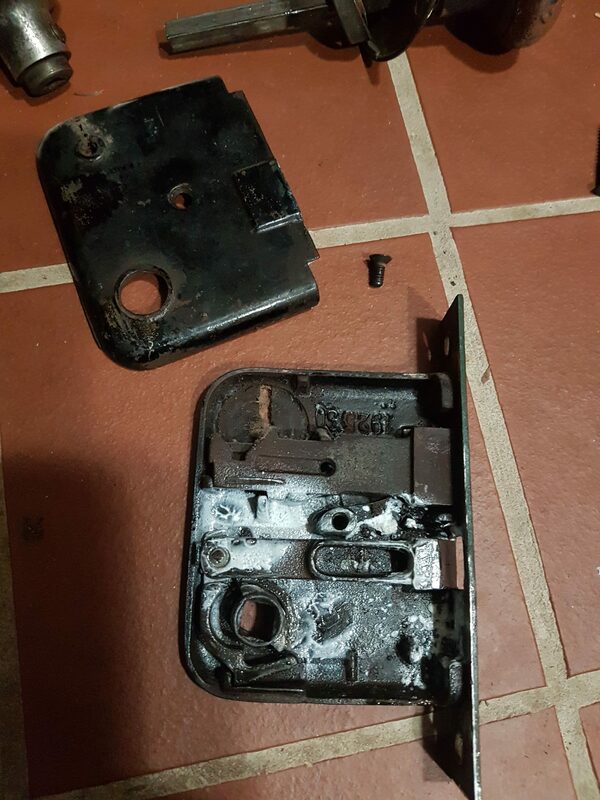 As I said earlier, the Stanley 78 just works – full stop. The Veritas planes also just work, but even better than the 78, which is very high praise coming from me. 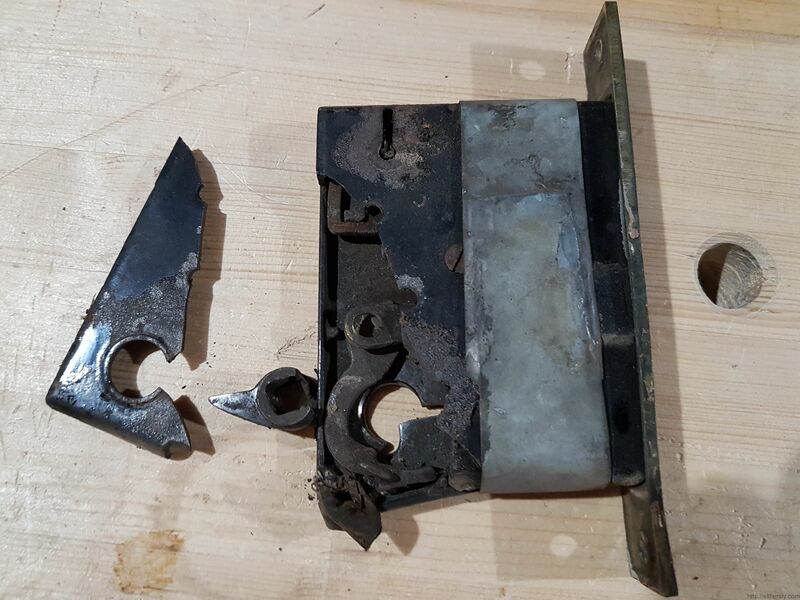 Part of it is the better two post fence mechanism that keeps the plane square to the cut and part of it is the skew blade that pulls the plane into the fence as you cut. Of course, because we are talking about skew blades, this temporary infatuation will evaporate come sharpening time. The straight blade on the 78 is dead easy to put an edge on and not too fussy about being exactly square – I doubt it will be as painless with the Veritas. With the positive feeling still firmly in place, I started cutting my rabbets. 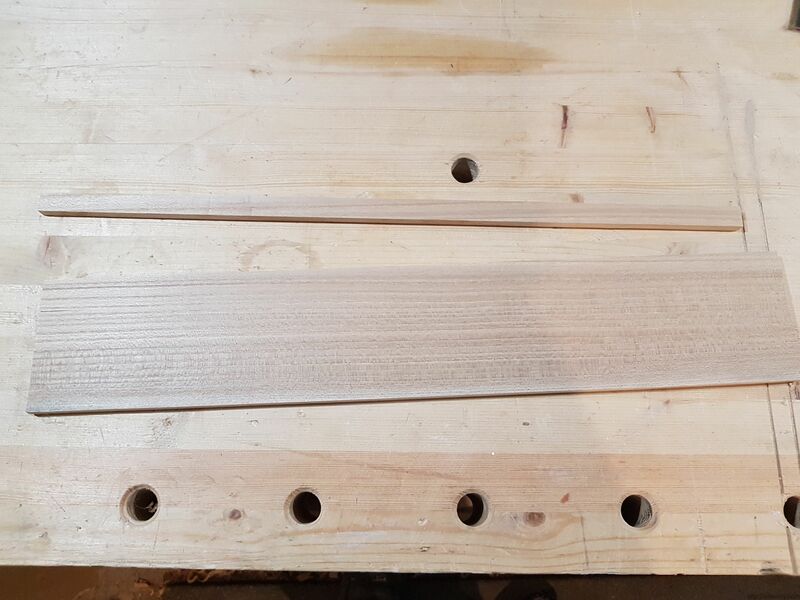 The skew angle of the blade results in the most lovely spiral shavings that run the length of the board. For those of you who are reading all this and thinking “why didn’t I just run the rabbet on my router table?”, you have clearly not used a good rabbet plane before. Setup takes only moments and with only a subtle noise, similar to the tearing of paper (no earplugs needed), the job is done. In the end, you have a perfect rabbet and only a pile of springy shavings to collect. No dust, no fuss, all good. The sense of satisfaction is palatable. 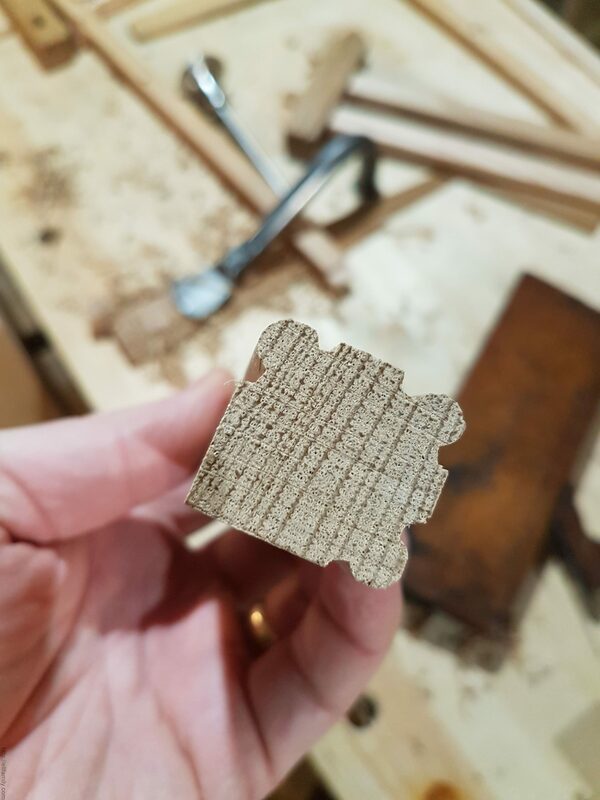 Cutting rabbets with the grain was so much fun, I thought I’d keep it up with the cross grain rabbet for the top. Turns out that while this works, it is not nearly as neat and clean. You need to use the nicker to sever the fibers as you are forming the rabbet. On hardwood, this works pretty well. Unfortunately, likely due to my particular technique, there seems to be just enough spring in softwood to make this not work nearly as well in pine. 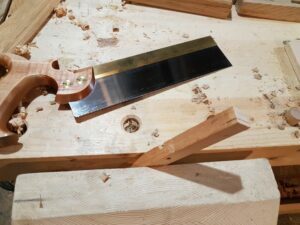 With pine I find myself constantly re-cutting the cross grain edge by hand and so alternate between plane and knife (or chisel), which just slows things down. Hind site is 20/20. 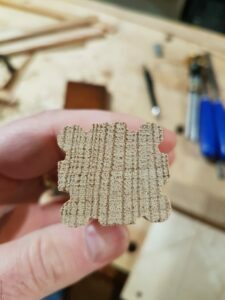 I should have done the cross grain rabbet with a saw and router plane as I did with the dadoes below. I like cutting dadoes. Not sure why but there is something satisfying in the outcome. Not sure my technique is the best but it work for me so here goes. First step is to cut the edges of the dado with my marking knife. 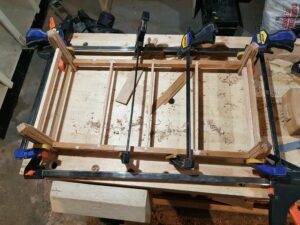 I do this directly from the piece that will be fitted to the dado, the shelf in this case. Next is to cut just inside the knife lines to depth with my giant back saw. 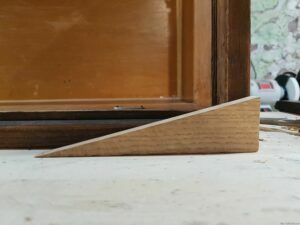 For those of you wondering why the back saw is so long, it is from a vintage Stanley miter box. Initially I found it hard to keep the saw square. I’ve got that in hand now and find the length of stroke I can take really speeds things up. It also makes judging the registration of the blade to the intended cut easier. 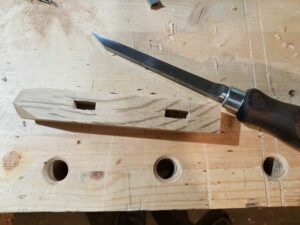 The next step is to hog the waste out with a sharp paring chisel. Finally, I clean the dado up to finished depth using a router plane. I use the Veritas version of the router plane. The vintage Stanley 71s work without question, but the depth adjustment is somewhat more of a pain than what is offered with the Veritas. Given that a new Veritas is not significantly different than what a good worker Stanley is going for, I erred on the side of ease. My opinion only, of course. If everything is done correctly, the shelf should slip right in. Luckily that was the case here. Next step, assembling the case and dealing with the shelves. Part 2 of this build can be found here.